Cover Run celebrates the awesome work (both sung and unsung), of cover artists even the best interior pencillers wouldn't mind stepping aside for. This month the spotlight shines itself on Greg Horn and Elektra vol 2 issues 1-22. Now a well known 'ladies man', when Greg first tackled Elektra, he was just another newbie. Before the end of the chessecake artists twenty two cover run was over however, this 'newbie' would find his work used by director Mark Steven Johnson as the inspiration for Jennifer Garner’s outfit in Daredevil, and responsible for scoring the fictional character a "virtual modelling" job with Karin Models. Well, when you make the sai-wielding seductress look like this you would wouldn't you? While I still border the fence as to whether Elektra should have ever returned, Greg Horn's covers made fans return month after month in droves. Marvel even offered text free variants of many of his covers so the work could truly speak for itself. Not that it needed much help. My pick of the bunch, easily the cover to #3. Shown below textless, it has to be one of the defining images for the character and everything that rocks about her. She looks powerful enough to take on Storm! For more Greg Horn, visit Greg's amazing website! Ah, comic book cover gold! The cover to No3 is used frequently and, you're right, it is a powerful image and less, ahem, pervy than some of the others. I won't lie - I can get rather keen on Mr Horn's work on occasion (incidentally, what luck to be called 'Horn' and draw this kind of art?) My own favourites are the saucy but deadly No13 and the, ahem, interesting angle on No2. In less tawdry matters, I read somewhere that issue 10 was originally to include a needle in Elektra's arm but that was dropped at the last minute. It appears that salacious objectification is okay but any hint of drug use is a definite no-no. that number 3 issue is one smoking hot cover! 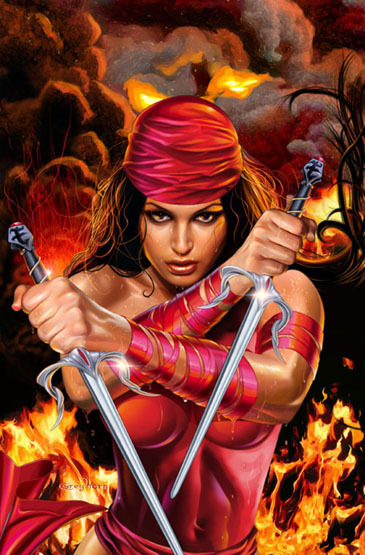 hot damn Elektra looks good! and deadly! i so wish my last name was Horn. my last name just starts with an "h", but that's as close as it gets for me. Weren't one or two of these images used in a card set? I know I've seen a few of these. That last one is one of my favorites. He pays attention to the placement of every drop of sweat. Thanks guys - glad you liked the choice! I think the cover for three is one of those covers that looks better the bigger it gets - it would be amazing on the wall too. Maybe even convert a few non comic book fans in the process - the rare breed that they are! Great post Dan..these bring back good memories..i need to re-read them again. Thanks IFF - I did the same creating this post! While I didn't collect the series in solo form right the way through the Daredevil nut in me couldn't let Elektra sit on the shelves. I think I actually liked reading it again lately more so than I did at the time too. Hey Anon - that wouldn't surprise me! Her likeness from cover to cover stays exactly the same in every way. Cheers for droppin by and the commenting!